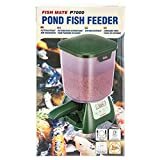 The NICREW Food Dispenser is our pick for the best automatic pond fish feeder, in which you can feed up to 5 times a day. It is only powered by 2 AA batteries and has an easy off button to pause feeding. Our step-up pick is the Flexzion Programmable Dispenser and it has a capacity of 1.6 kg or 4.25 liters of food. It has an easy to read screen for the settings and is powered by 4 C batteries. The budget pick is the PROCHE Adjustable Dispenser and it can be easily installed in two ways and you can set up to 4 feeding times on a schedule basis. It also has a slider for easily adjusting the food amount. 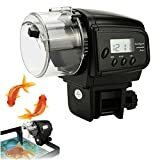 An automatic pond fish feeder is a kind of device that lets you feed fish from your pond without having to do it manually. It is a great unit that you can install to your body of water so that you won’t have to feed them manually. This is much like those that are used in an aquarium, except that it works on a bigger scale because it is a body of water that requires more space to keep. Pond fish can be a lot harder to manage than aquarium fish. Whether it’s a man-made pond or a natural pond, feeding the fish can be on a larger scale than feeding those in an aquarium. The fish in the pond can behave differently than those in an aquarium due to the larger scale of the area, because aquariums only have limited space for the fish to hide or to swim around. Thus, you need a bigger unit for feeding. Feeding your aquatic creature can be a hassle, because different species can require a different kind of schedule of feeding. For example, some species can be picky with different kinds of foods, and some are also too big or too small for certain doses of food. This is why you need to pick the right food for them in order to get them fed properly so that they won’t run into any kind of trouble with eating. Most of these automatic machines can have timers, much like the dispensers that you can buy for your dog or cat. This allows them to be fed in a timely manner so that they won’t bloat with excessive eating. These dispensing machines move the food from the container or hopper to the exit at the bottom so that your pets can easily reach them. That is true for almost any kind of pet. It is important to feed your aquatic creature on a regular basis so that they won’t easily get sick or die from being underfed or overfed. In the same way, you should also research more about the species so you will get more acquainted with their eating habits. Sticking to a schedule helps reduce bloating and at the same time, you can get things in order. Researching on the appropriate food type also helps your aquatic creatures get more nutrients. Programmable: it should come with a timer option, which is the most important thing since it is automatic. This means that you can set the times of the day when you want the machine to dispense food, so that your pets can easily grab onto their food at specific times of the day without overeating or undereating. This means that you will not have to manually feed them, which is a hassle if you are also attending to other things. Ease of installation: you have to consider a unit that is easy to install in order to get the best results. The instructions and the manual should come with the right directions for you to easily put it together and install it onto your area or aquatic resource. It should come with diagrams and also safety warnings so that you won’t easily mess up the machine or unit when you are operating it or filling it with fish food. Power source: most of these units are powered by a battery but some can also be powered by solar panels to recharge them. The power source is important since without it, your unit will not run properly and timely. The battery should have sufficient power and should be recharged less often to avoid hassle. It would also be great to get a solar panel resource so that you can power your unit up with less maintenance at hand. Capacity: this depends on how much fish you keep in your pond. If you have small aquatic animals then you can just go for a small unit. However, for bigger populations as well as bigger species, you should consider one that has a bigger capacity in order to fulfill their needs for better food distribution. This is also highly important if you are using it to fill up the tummies of marketable aquatic creatures. Moisture-proof: you should consider a unit that is moisture-proof to protect its inner electronics. Since you will be using it outdoors, it is important to consider one that is weatherproof so that your unit will last longer. Since it will not be like the aquarium unit, it should be durable and should protect against moisture, mold and the like at all times. This is so that the components inside can stay safe and dry all the time. The NICREW Food Dispenser is our top pick, which is powered by two AA batteries so it is very easy to set up. You can easily program the device with its off and on button, as well as the display screen and the easy controls. You can use it to feed your aquatic animals up to 5 times in a single day. You can also set it for up to 3 rotations for each of the feeding times. The food is also kept dry because of the unique ventilation system, which is powered by a fan that is built into the system. You can also put up portions for your aquatic animals due to the alternative rotation timing and scheduling, as well as the slider that you can use to adjust the food amount for each kind of feeding period. It is also moisture-proof so you can definitely use it for outdoor purposes. The only con but not a deal breaker with the NICREW Food Dispenser is that it might not be ideal for smaller ponds, so it should be used for medium to large sized ponds and species. Our step-up pick is the Flexzion Programmable Dispenser, which has an easy to read screen that can allow you to access the controls at any time. It has a clear LCD screen so that you can adjust the settings of the machine easily. The installation is straightforward and the unit is simple in its looks. It is only powered by 4 C batteries, which can also be easily found, like AA batteries. The food hopper has a capacity of up to 4.25 liters or 1.6 kg of fish food. You can display or set up this kind of machine in two ways: mounting or free standing. You can also easily clean it up because the tank for the food can be detached easily. You have options for feeding schedules for up to 99 days, plus there are 4 schedules that you can program in place. The PROCHE Adjustable Dispenser is our budget pick, which also allows you to set up to 4 feeding times in one go, so that you can spend less time on having to schedule the feeding process for your aquatic animals. It is easy to control due to the included slider so that your aquatic animals will get the right food or portion that they deserve. It also has a manual feature in case you don’t want to use the automation. 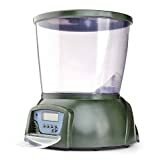 It can accept almost any kind of fish food, such as fakes, strips, powders, pellets and many more. It is only powered by 2 AA batteries and it comes with a user’s manual for ease of installation. It has 1 to 2 rotation times per feeding time and you can attach it to walls in different ways. It is also backed by a warranty of 12 months. The iGrove Daily Feeder is a great choice if you want to mix food on the go, especially if you want to use different kinds of aquatic pet food for your source. It can be set for up to 4 times in a day for its feeding schedule, and it has a very good timer option. It can also be used for crumbling food and it will also protect the food from getting moisture from the outside world. This equipment can be easily mounted and it can also go for a freestanding position if you wish. There is a slider that also allows you to adjust the amount of food that you want to give to your aquatic animals. It only requires 2 AAA batteries to run and it has a clear LCD screen that displays the settings and information. The mechanism is meant not to jam or clog. The Sweeney Feeders Bank is a great choice for those with larger bodies of water and have more aquatic animals to feed, because it has directional properties that make it easier to operate for large scale purposes. You can feed any kind of body of water and aquatic animal combination for up to 24 times a day and you can also customize the duration time of each feed to meet your needs depending on the species that you have. It also has legs that can be attached to the bottom of the pond, which makes it easier to dispense the food to the aquatic animals. The pads also come in handy for easily leveling so that you can adjust the machine much easier than others. It has a solar charger, which is very helpful for when you don’t want to use batteries but want to use something that is more eco-friendly in its solution and technology. 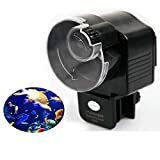 The Fish Mate P21 is a great choice for those who want a quartz timer and for one that can be used for either small or large bodies of water. It can be used for one year with just one AA battery, making it very efficient when it comes down to its maintenance and feeding mechanism. This also makes the machine very efficient when it comes down to cleaning as well as accuracy due to the quartz. The feeding quantity can be adjusted, which means that you can make it work for a longer period of time and you can feed in your preferred amount and timing as well, which can benefit different species of aquatic animals that are kept in your body of water. In addition to that, it can be work for up to 21 meals in just one day, making it very time efficient. The P7000 Pond is a great choice for those who want something that is safe to use in the dishwasher for ease of cleaning and maintenance. What’s more, it has a capacity of up to 30 cups or 6.5 lbs in its dry food hopper. It can be used for different kinds of aquatic animal food types, such as pellets or sticks. The battery can last significantly long, from 6 to 9 months, which can save you a lot later. The feed sizing for this kind of machine is very consistent and accurate so that you don’t have to worry about improper sizing and wrong measurements for the food pieces. This is because of the fact that the mechanism for feeding has been accurately designed. The whole housing is also weather resistant so it can really be used outdoors without the problem of mold, mildew and wearing parts. 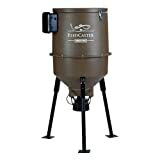 The Moultrie 30-Gallon Feedcaster is something that you might want to use if you are feeding a very large area. It requires only 1 battery at 6 volts of power so it is very energy saving. It can also be used for the edge of the water as well as for dock mounting. The legs are also sturdy and durable due to being powder coated in their finish, so that it can withstand the test of time and weather. Additionally, the square feet also prevent the whole unit from toppling over as a standalone unit or freestanding mechanism. You can put in up to 100 lbs of food into the plastic hopper that is of food grade so it will not hurt the animals that you are going to feed. The directional shroud can go for up to 25 feet in its straight casting for the food, which makes it unique among others. Additionally, the timer can be programmed for 1 to 20 seconds on each feeding, for up to 6 times in a day. This is very helpful for when you want to have a very good schedule of feeding for your aquatic animals. The MonkeyJack Digital Pond is a good choice for when you want something that is freestanding and also something that can be converted into a mountable unit. You can also pack and schedule up to 20 grams in each feeding, for up to 4 times a day in its scheduling. The tank capacity of this unit is up to 4.25 liters and you can also program it continuously up to 90 days, preventing the hassle of manually changing the schedule. The control panel is very easy to use and to operate due to the buttons being made out of soft rubber. There is also a low battery indicator so that you can get alerted when it is time to change the battery. There is also a digital clock that helps you know the current time for feeding. It is a great way for those who manage aquatic sanctuaries but need to get out of the house for a vacation trip. If you want something that can be easily mounted, the Amicc Automatic Timer is a good choice. It can feed every 24 hours or you can also select every 12 hours depending on your scheduling needs. It is simple and straightforward and is ideal for dry food. It has a slider that is designed to adjust the amount of food that you should feed to your aquatic animals. The unit can take both small and large food items, in which the large ones can be fed up to 28 times and the small ones can be fed up to 5 times per 8 grams. It can be powered either by battery or by an AC outlet. It can be used for flaky and grain aquatic pet food and it will work on both aquariums and ponds due to its easy to stick design. There were others that were not up to our standards because they were too hard to install and had very little capacity. They were also a bit too hard to program so they may not be ideal to use for most fish pond owners out there. Q: What are the benefits of having a small natural pool in your local area? 1. It helps you to conserve water because some plants can be easily watered from the pool source itself. 2. Other animals, such as frogs and insects, can also sit alongside your aquatic creature in the pool. 3. You can be closer to nature because people and children in your house can see animals up-close. Q: What are the different categories of aquatic creature that can be put in a pool? These ones are the ones that easily swim to the surface and do not stay at the bottom, so they are great for those who want a pool that has mainly a lot of aquatic creature for display and that people can easily see. It is also a lot easier to feed them in the process. These ones are the ones that have striking colors, such as those Japanese koi aquatic creature, which are the most popular of all pool aquatic creature species. These are only suitable if you have a big enough pool to accommodate many aquatic creature in just one go. Otherwise, consider aquatic creature species that propagate less often so that you don’t have to waste when it comes down to maintenance, cleaning and feeding. Q: Which species of aquatic creature can be seen in a aquatic creature pool? They are one of the most popular types of pool aquatic creature that can be found, and they can be easily controlled in population if you have bass in the pool as well. They can have the habit of stirring up the mud in your area. The koi aquatic creature, also known as nishikigoi, are also types of carp and are known for being very colorful, coming from Japan. They can vary in colors, such as black, orange, white and red, and are one of the most popular pool aquatic creature species you can keep. This one has a yellow and white color and sometimes it is also gray or black, and they can also feed on smaller creatures. It can be found in streams and they can be kept in a pool easily as well. They quickly reproduce so they need to be on bigger pools with more bass. Also known as the redear sun aquatic creature, they are the ones you can keep if you only have a small pool, because it does not reproduce as much as other species, making it less of a maintenance. It can also feed on other organisms, as well as water vegetation. The mouth of this species of aquatic creature is medium in size and the body can grow up to 7 inches in length or less. They can also be controlled with enough bass in a pool, and can be found in other small streams as well. The crappie can range up to 12 inches in length and has either a black or white color depending on the subspecies. It can also be found in turbid water and they can feed on other smaller organisms. Adult crappies can grow up to 7 inches on the minimum (12 inches is the maximum). They are mostly found in shallow water and can be great for its saw-like ridge design. It has a silver color and feeds on microorganisms as well. This kind of minnow can grow up to 3 inches and has a silver color that is a little duller than the gizzard shad. It can be seen in some pools that have more bass. They can leave their eggs on rocks and can feed on organisms as well. They are ideal for summer water of up to 75 degrees Fahrenheit and can have black spots for the youngsters. Some will have a bluish shade, but most of them will have a white belly and a gray back. They can grow up to 5 inches in length but some can go for up to 8 inches. The youngsters can spawn after a long period of winter. They are great for bass hunting and they also feed on insects. They can grow up to 10 lbs in weight and they are ideal for temperatures of 60 to 70 degrees Fahrenheit. They can eat a lot of kinds of items, including small aquatic creature and even frogs. They are known as a predatory species of aquatic creature. Q: What are the ways you can clean up green pool water? 1. Invest in a pool vacuum. The pool vacuum can work well in the spring and in the fall. 2. Go for a pool skimmer. This is a kind of mechanism that skims the debris that fall onto the pool before they get to the bottom of your pool. 3. Sludge reducers can be helpful. They work well into reducing the amount of sludge that is stuck at the bottom of your pool. 4. Add beneficial bacteria. These organic matter can help eat away the stuff that are growing in your pool, making it green. 5. Try a phosphate remover. This can help reduce the amount of phosphate in the water. Phosphate is the very reason why most water sources can turn green due to algae growth. 6. Consider the amount of aquatic creature. You also need to know how many aquatic creature will fit well on a specific pool size. 7. Choose your aquatic creature species carefully. Some aquatic creature reproduce like rabbits and you might want to avoid those if you find that your pool gets green more often due to excessive waste material. 8. Try a UV light system. Usually, UV light systems nowadays proceed to kill harmful bacteria and other microorganisms that might turn your water green and unhealthy for aquatic creature. Q: What are the different types of aquatic creature food I can purchase? The flakes are the most popular of all types of aquatic creature food out there because they are the easiest to disperse, to buy and to sprinkle. They come in different kinds of varieties depending on the species of aquatic creature that you have. Another popular type of aquatic creature food would be the pellets, which are mostly ideal for larger species. They can either float or sink depending on how much their density is. These contain those live food, such as bloodworms, plankton, krill and other organisms that most aquatic creature eat while in a real body of water. However, the catch is that the organisms are freeze dried so they are easier to digest. Different from freeze dried ones, they can vary depending on the type or species of aquatic creature that you want to feed. They can also come in krill and others like shrimp. This one is great for those who love algae. Spirulina is great for a staple diet while seaweed is ideal for feeding on a weekly basis. If your aquatic creature is a herbivore then you should consider this type of food. This category refers to other foods that might also be loved by aquatic creature, such as cucumber, lettuce, and even insects like crickets and earthworms, if you wish. Q: Why is the water quality of the aquatic creature sanctuary important? If you don’t know how to find out these numbers, consider testing your water with pH level testing kits, as well as ammonia and nitrite testing kits. Q: What is the lifespan of koi aquatic creature? Q: Aside from aquatic creature species, what other animals can be found on pools? Bird species like blackbirds, kingfishers, Canadian geese, herons and mallard ducks can be found on pools. You’d probably see most dragonflies and water beetles associated with pools. Others include caddis flies, pool skaters and mayflies. The frog is one of the most important pool animals you can find, as well as the American toad. There are other amphibians, such as newts and salamanders, that can be found on pools. There are also some smaller mammals that may dwell on pools, especially natural pools, such as beavers, muskrats, opossums, moles and raccoons. Q: Which species of aquatic creature are best recommended for which size of pool? Q: How often should I feed my aquatic creature? 1. Know the species of aquatic creature that you have and how often it needs to be fed. 2. Anything that aquatic creature can easily finish within 5 minutes is a good rule of thumb. 3. Invest in an automatic aquatic creature feeding machine, just to be sure. 4. Know the type of food that you are giving to your aquatic creature to avoid overfeeding. Q: What are aquatic creature diets? 1. Carnivorous – these types of aquatic creature should not be paired with other aquatic creature because they will also eat the other aquatic creature. They should be isolated from others because they can’t eat algae and veggies due to the fact that their digestive system wasn’t constructed in the way that omnivores and herbivores are. Live food such as worms, plankton and the like are the best meals for them. A good example would be any of the shark family. 2. Herbivorous – while they eat plants, algae and the like, they actually don’t have a real stomach, but rather have a plant breaking intestine. They should be fed more frequently because food doesn’t stay in their tummies for too long, due to not having a stomach to store them at all. 3. Omnivorous – as the name suggests, these are the ones that are the best for both kinds of food, whether it is meat (live food) or algae (veggies). They are great for a community tank because they can adapt to whatever the situation is. Q: What are the pros and cons of pools versus aquariums? Pools can accommodate different species. Aquariums may be limited to specific species only. Pools are more difficult to control with algae due to being outdoors. Aquariums can also have algae, but this depends on where it is placed. Maintaining a man made pool is pricier. Aquariums are pricey but not as much as a man made pool. Q: If I want to build a manmade pool, what factors should I consider? 1. The depth of the pool should be just right for the aquatic creature species to thrive and swim around. 2. Soil and sunlight should go hand in hand with each other. 3. You can also try premade kits for ease of installation and beginning a aquatic creature pool. 4. Choose your liner wisely – preferably butyl rubber with good thickness. 5. Waterfalls add oxygen to your pool to prevent mosquito eggs and algae buildup. 6. Choose your edging wisely – preferably some rocks and plants of equal size. 7. Maintain your pool as much as possible and as needed. 8. Go for a solar-powered system to save energy costs. 9. Learn how to winterize, if you live in a 4-season country. 10. If it rains a lot, go for a curb, so that it will avoid spills and overflowing. Q: What common mistakes do people make when building a pool? a. Wrong location – consider picking a location with up to 5 hours of sunlight. b. Incompatible size – consider the right size that’s meant for your aquatic creature species. c. Not deep enough – consider adding depth if predatory birds are a main concern. d. Stone lining problems – consider your choice of rocks to prevent algae buildup. Q: What mistakes do beginners often make when keeping aquatic creature? 1. Not picking the right tank – pools are for experts so you should begin with a decently sized tank of at least 30 gallons. 2. Not filtering your water often – filtration should be done properly and the gear should be replaced and maintained as much as needed. 3. Substrate problems – you should pick a decent substrate not just for show, but also for the pH levels of the plants around it. 4. Not worrying about bacteria – algae and bacteria can grow faster if you don’t maintain it properly. The solution is to purchase good bacteria that can be deployed to your aquatic creature sanctuary. Q: What are some common misconceptions with pools? This can actually make room for trouble due to the run-off of weed killers and the like. Not necessarily true. As long as you can see the coin at the bottom of the pool, that means it’s clear and safe for the aquatic creature. That depends on the depth, but pools are really too shallow to become a threat to anyone! Not always true, because some koi aquatic creature can survive in pools that are only 2 feet in depth. This won’t happen if you plant lilies, dig a deeper depth for the aquatic creature to hide and use decoys. It’s actually the other way around, because biological filtration is enhanced with rocks. Not if you put a waterfall on it! Not really true, because actually, trees can help shade your pool from algae buildup. Not necessarily true, because you can actually increase the value of your home with a lovely pool outdoors, according to most real estate agents. Q: What are some myths associated with aquatic creature keeping? 1. “They can only grow to your aquarium size” – not necessarily true, because some aquatic creature can grow much more depending on how they are raised. 2. “Adding salt makes aquatic creature healthier” – not if you have freshwater aquatic creature! Only do this if you have saltwater aquatic creature or any of the similar kind. 3. “You need carbon to filter water” – not always true, because different filtration systems can work even without carbon. 4. “Scavengers such as janitor fish can do the cleaning job for you” – oh c’mon, don’t leave it all to the poor guy! A proper aquatic creature keeper knows that cleaning the tank or sanctuary is not just the job of the aquatic creature or other creature in it, but also of the keeper. Q: Which pool animals are endangered? A: Aquaculture is the field of harvesting fish and other aquatic animals either for marketing or even for leisurely purposes. It has been practiced for many years already. Q: Why are fish good pets? 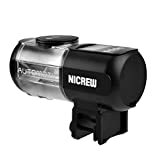 As a whole, we think that the NICREW Food Dispenser is our pick for the best automatic pond fish feeder because of the ease of controls when it comes down to feeding and scheduling. The battery life is also good and it is easy to power it up with AA batteries. The scheduling of up to 5 times a day makes it very easy to handle your pets or aquatic animals.